Whenever I think of "homesteading," I think of the Ingalls family out in their little house on the prairie. They broke the sod, raised their food, and lived off the land. I have long wanted to turn our own home into a homestead, and for about two years I've been dreaming and planning for when we'd buy our own house and have a yard with a garden and chickens. There are several cities and suburbs that we looked at while house-shopping, but after all my careful chicken research, we learned that most places didn't allow chickens in neighborhoods! That completely changed where we were willing to buy. We moved in to our house at the end of summer, and figured we'd get chicks in the spring. 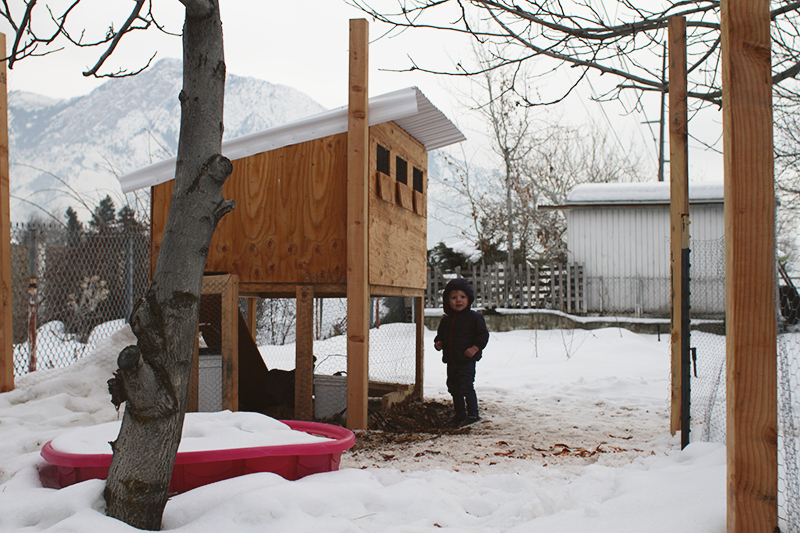 But the month before Christmas, our next door neighbors sold their house - and they needed to get rid of their chickens within the month. They were willing to give them to us for free, for the convenience of being able to have one less thing to worry about in their move. YES PLEASE! 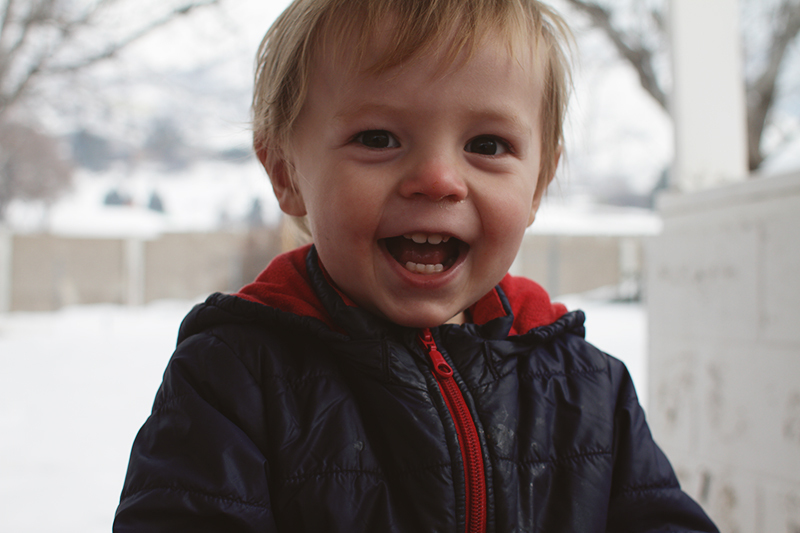 So I roped Travis into a lot of work in the next (cold, dark) week. We are so happy with our little flock. 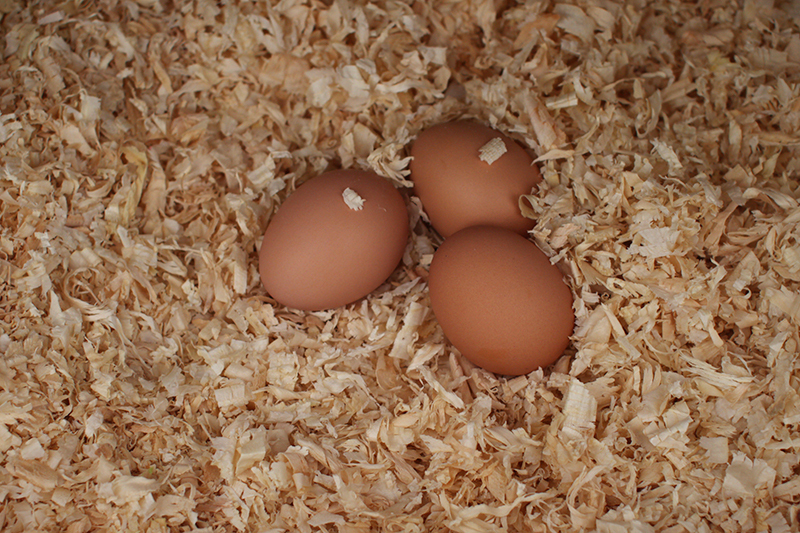 They're so funny, and they give us five beautiful little brown eggs every day. 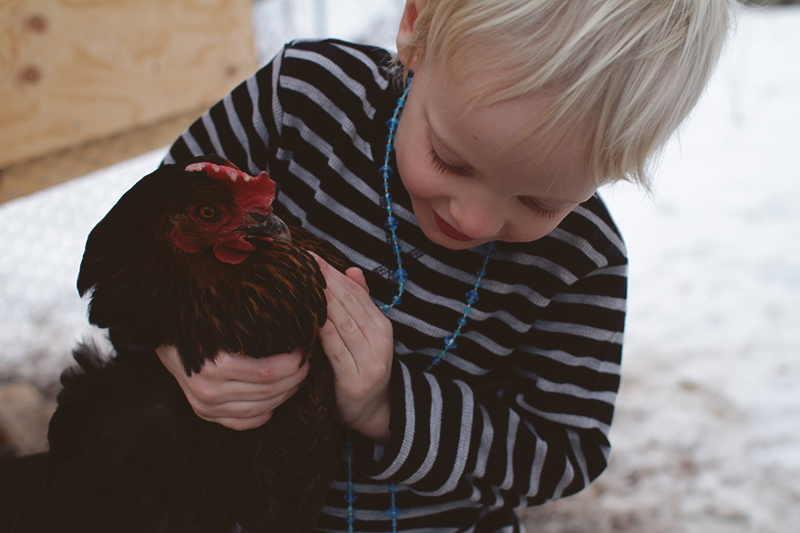 I know we're not really homesteading, as we live in a city- and still have to buy eggs from the store every week! (Can you believe that we go through significantly more eggs than five a day?) But I feel one step closer to living in an E.B. White novel, so I'll take it! 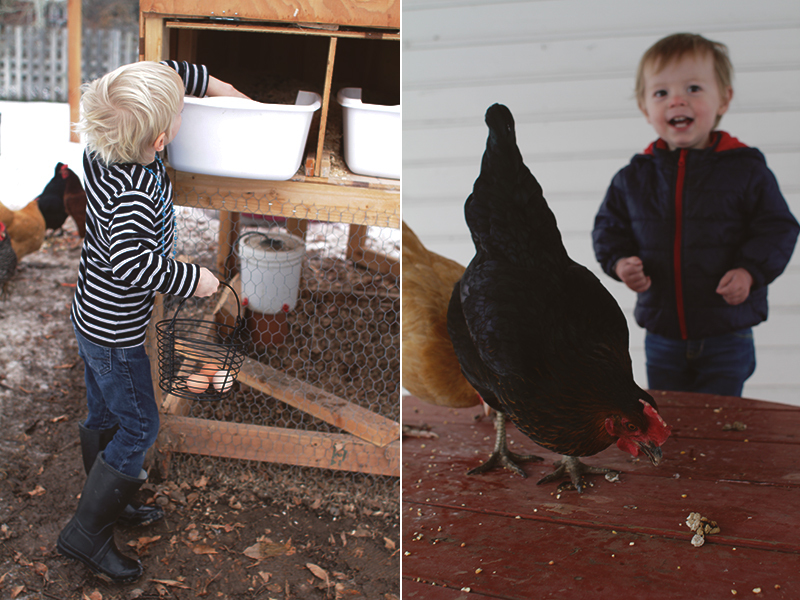 The boys named the chickens themselves, so everybody has their favorite. Here's Grey hugging his favorite lady bird, Aunt Katie. The birds favorite place in the entire yard is sitting on top of our outdoor table! They spend ALL DAY on it, and consequently, it is covered in a ton of poop! We are going to have to borrow a power-sprayer in the spring and wash the whole patio! No body told me that chicken poop was the size of dog poop. I seriously thought it would just be like occasional splats around the yard. 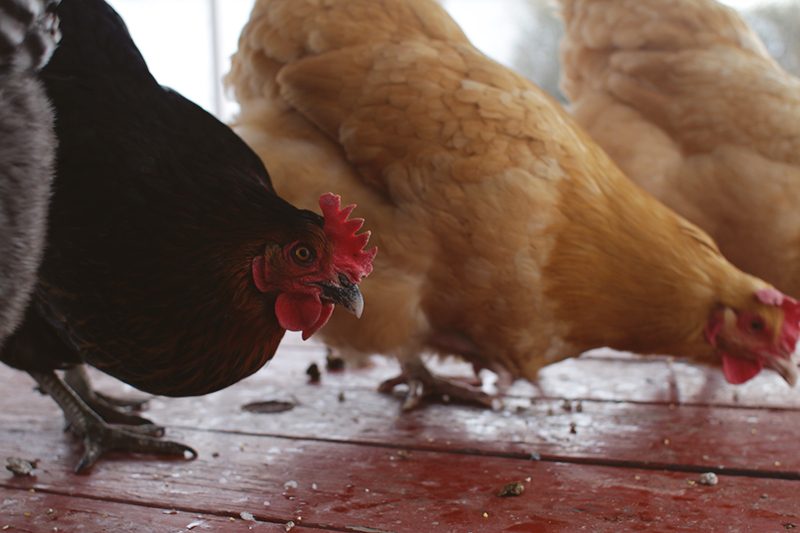 The chickens are surprisingly like goats: they eat all of our food scraps, they follow us around the yard begging for treats, and they like to be on the highest surface they can reach. That's okay, it makes them easy to see and catch! Here's Micah pictured with his favorite, Princess Leia! 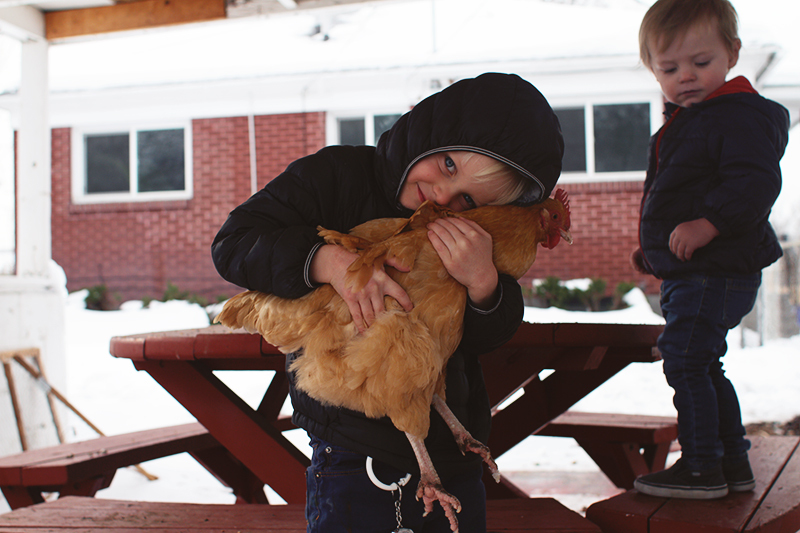 I'm glad that these chickens came from a family with kids, because (while they're not totally cuddly) they're not afraid of us and are easy to hold and feed from your hand. 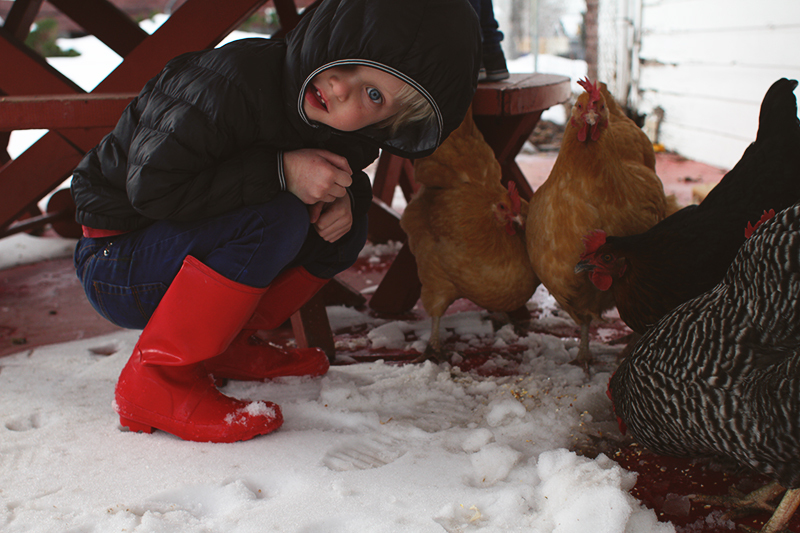 Above is Duck (named by August) with Aunt Katie and a bit of Cottonball. This chicken (above) is my favorite, Tootles. At first, I thought she was the friendliest, because she always sprints to me when I call- but I've since decided that she's just the wiliest! 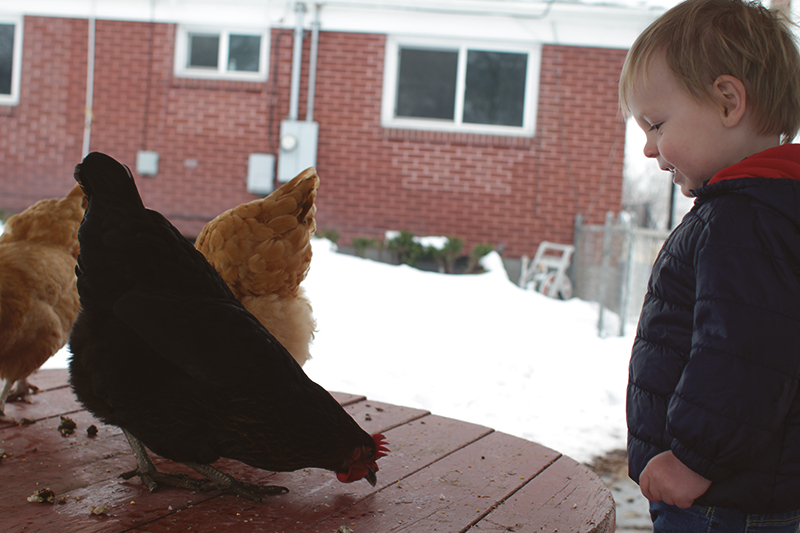 She knows that I come with food and treats, and I've seen her pecking and bossing the other chickens. Poor Duck is at the bottom of the pecking order, and the boys have taken to bringing Duck special treats because they know that Tootles won't let her share with the rest of the chickens. It's probably mean of me to love Tootles even though she's a bully, but you should see her sprint to me across the yard when I yell "Tootles!" She's the fastest, fattest little velociraptor. And it doesn't hurt that she's so pretty and has such a funny name. Velociraptor is the PERFECT way to describe them! They always reminded me of teeny dinosaurs the way they ran across the backyard when we had them haha. So glad you're enjoying them! We loved ours. Great photos! 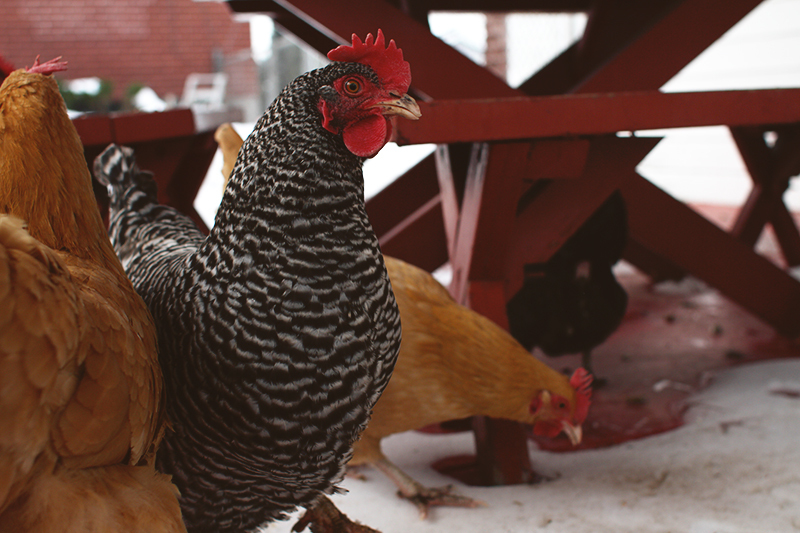 Do you pen the chickens in at all or are they totally free range? You are right, Tootles is a beauty. Beautiful photos! 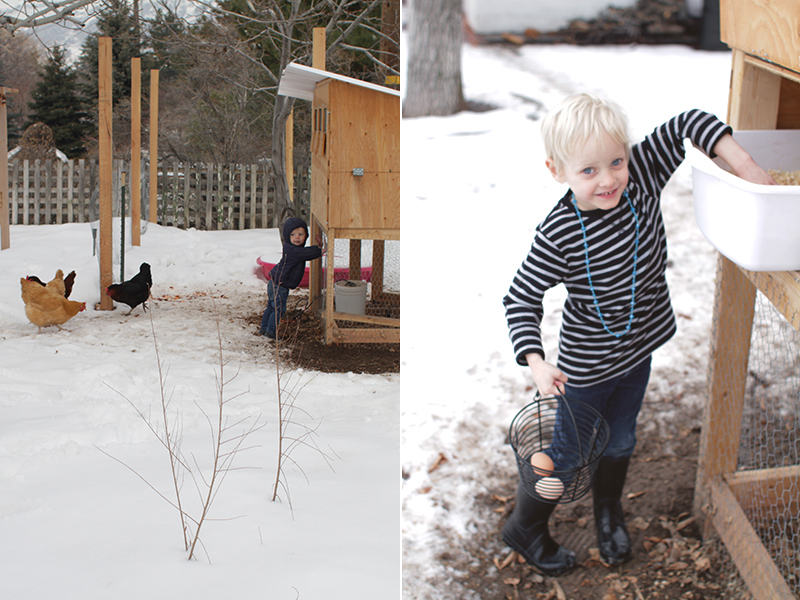 I can't wait for the day when we can finally ditch the nasty cinder block student apartments for a backyard and chickens :) I haven't been able to keep chickens since I was a teenager, but we loved it! Aren't they so fun? Congrats!